Cylinder locks are simple and quick to replace, they can be changed without altering the mortice lockcase hardware. Although you'll probably see the majority of these cylinders in domestic properties, but they also work great in commercial settings too. The cylinder locks can be keyed alike, which means that many cylinders can be opened by one key, this brings the benefit of being able to grant access to several areas of a premises without a large number of keys. We're sure everyone gets a great sense of satisfaction from walking round with a giant ring of keys, but it's not very practical because it can take days for you to find the right one! There are a variety of different cylinders for many different purposes; we feature a variety of rim, oval and euro profile cylinders in order to suit your requirements, for example rim cylinders are held in place by two screws from the inside of the lock whereas the profile locks are threaded and screw into the mortice lockcase that is mounted within the door mortice. Although these cylinders come with 2 or 3 keys, more keys can be supplied upon request at a rate considerably cheaper than if cut by an independent key cutter. 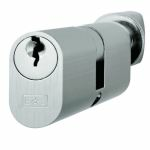 The cylinders can also be used in conjunction with multi-point locks and some mortice locks we have available here.